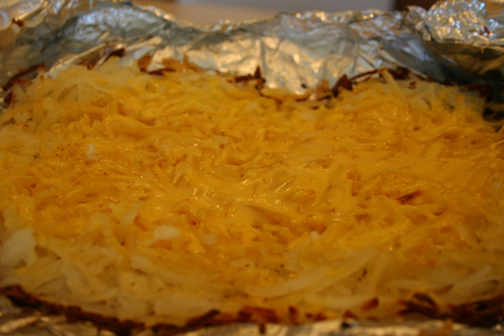 I only had shredded hashbrowns on hand when I made this, but they worked great. 1. Heat gas or charcoal grill. Spray 1 (18x13-inch) sheet of heavy-duty foil with cooking spray. Place potatoes on center of foil. Drizzle with oil; sprinkle with seasoned salt. 2. Bring up 2 sides of foil over potatoes so edges meet. Seal edges, making tight 1/2-inch fold; fold again, allowing space for heat circulation and expansion. Fold other sides to seal.